Yes it's clear as a day in those. Also look in full screen because the background of your screen does tone it down. It really looks bad. Once you see it you can't unsee it even in the daytime. Yes it's clear as a day in those. Also look in full screen because the background of your screen does tone it down. It really looks bad. This is not in my hands, but I can ask the right person for his opinion. Do I understand right that you want a checkbox in the setup of game for this effect? Yes. Likely some people can like it but I know I'm not the only person that doesn't like it. There was ticket about it in the feedback tracker. Pause key toggles it on/off. Also now I remembered another reason I want video option for it. If you use Community Based Addons that key doesn't toggle the effect off. I don't know why but the conflict is there and CBA is used pretty much everywhere. That key also removes the Development Build indicator from the lower right corner. Naturally some compression so it isn't 100% accurate but it's really that obvious. 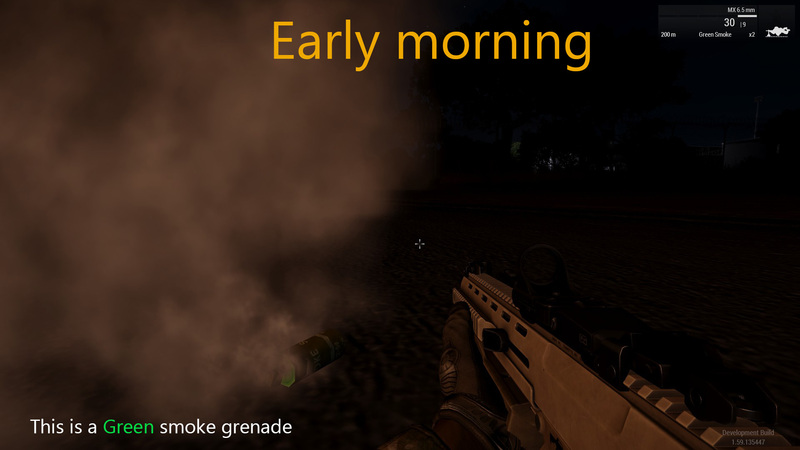 Is anyone else having issue with smoke grenades (either throw-able or launchers) not showing the color of the smoke if its dark outside? It doesn't matter if it';s in the early hours of the morning or late at night. 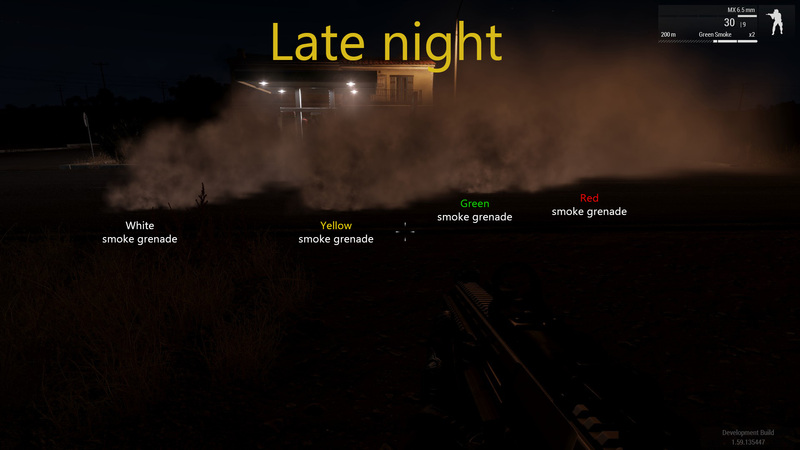 Basically anytime that there is no light being cast the smoke does not render the color, even if there is a light source nearby. I haven't double checked on the stable build to see if this is the case but I don't recall it being this way. I see in our tasks, this bug was closed - fixed, Thanks again for your feedback. When there is overcast as weather... what do you expect? Guess why overcast weather is best for shooting fotos for use in texturing? No direct shadowing / lighting. Fully realising this is a matter of opinion.While playing around with splendid new visuals I did notice that going from an awesome night scene. I put on night vision and it all went pretty bland. Any visual changes for night vision? I think it's nonsensical to wish for a "warmer", "mediterranean" sunlight. Sunlight in the mediterranean should be as "white" or "daylight neutral" as pretty much everywhere else in the world. If mission designer want to give their mission a warmer, romantic holiday touch, they should tweak lighing per mission as a special effect. Of course the "golden hour" is an exception. (There may also be other super rare weather phenomena, which give sunlight a warmer tint). Let me just add, that i and many others think that the positive examples of the new lighting that were posted here and on the official channels (sitrep, twitter) were stunningly beautiful with perfect color tone and nice, high dynamic range (mostly daylight shots) and i hope you can preserve that, when tackling the "problematic" conditions. By the way, i also liked the bright sky with high overcast, because it is quite realistic. 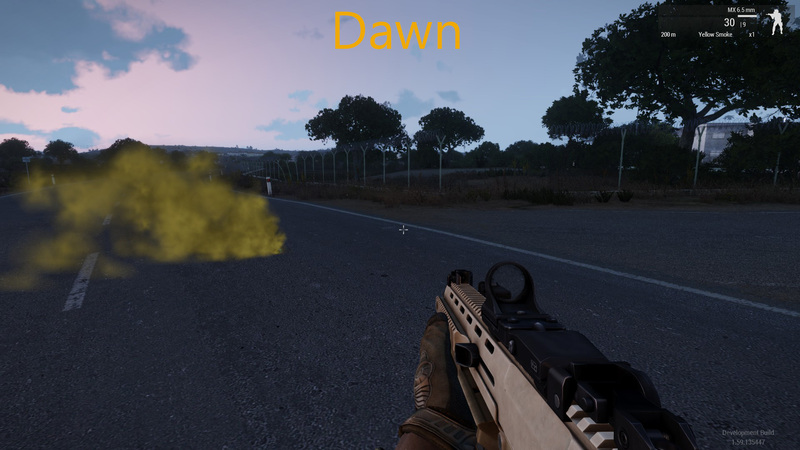 The dark clouds are a bit of a dramatization, or the interpretation of weather, that is not possible in arma. (for truly dark clouds you would need thick clouds besides thinnner or no clouds. Arma always renders a pretty even cloud coverage at high overcast, which in reality makes the clouds work as one giant light source, which would always appear bright against the landscape. But this is also the age old question of hdr vs tone-mapping, because the clouds may appear darker in reality, when our eyes adapt to them. I personally like the bright sky / hdr approach more, because it is more photo-realistic in the way a camera would render such a scene. I guess this boils down to the personal preference, I'm unable to see the vignette in a way it would bother me, especially in a gaming situation where I'm concentrating on what's going on in the center of my screen, also the monitor calibration and settings also play a role of course. Today's salt lake. I don't know what cause this. If you are tweaking contrast: with the contrast settings which look good daylight (100-110) the full moon nights are way too dark. They need 85-90 contrast to be able to see something. IMHO contrast settings affect the brightness of the night too much, I personally would balance it a bit more. Anyone else loving to play without NVGs and missing some "power" of the Moon? Hey, i want to thanks for great light improvment! But there is one change that remain unchanged which is lights from street lamps, cars - its too yellow for me. Right now we have 2016, most of street lamps on the East (chernarus in game) is white, most of modern cars have white (sometimes LED) lights. Is there any change of getting diferent colour of lights? I am not happy hear of troubles which you have. How I said I listen to your opinions and if I can, I will improve the new light. No trouble here. I was just responding to people asking for warm lighting on an overcast day. I really like the new lighting and I'm sure it'll only get better. Keep up the good work! For those who can't see the sun, the sun is there. In fact is the opposite there is too much sun, the light is too strong, the same for the rays. Through clouds we can see it shining, even through heavy clouds, we can see the sun shining, the same for the rays. Also through heavy clouds we can see the sun rays continuously expanding in circles. Is it possible to make water reflect at least the primary colors of the skybox without clouds at least? When you make water darker (e.g. for islands used in european setting) it looks quite unnatural vs. the bright sky when used with reflections turned on. Yeah it's possible to make water brighter via config but then it will look too mediterranean/transparent as a side effect. The first iteration of the visual update was golden on my pc as far as lods go. They changed smoothly and promptly. The current iteration is a mess. It flickers between LODs and decides on incorrect LODs given the distance. The following photo hopefully illustrates this. I don't like to be Negatron, but it's a total rewind from the recent goodness so I wanted to let you know my experience. Hmm I've seen this happening couple of times when using the camera view in 2D editor. I thought that it might be related to only that but now you said that, the issue might be the same. But this issue might be better in some other topic. Ditto for vacillating LODs today. Also I perceive a really odd shimmer (flicker even) in the shadows of trees and bushes. The LODs have been messed up since a few weeks maybe even month, at least for me. 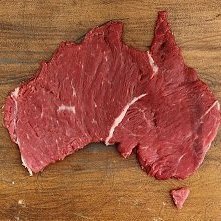 That actually looks about right. I revisited the topic of the "missing sun" or at least "missing sun warmth" of the visual upgrade and this is the best I came up with (bottom right you can see the watermark on the dev build one); and to say yet, the weather setting was completely "clear" on both shots - in fact I created the first pic on dev build the way i placed the player initially in 3DEN editor and then just reverted to stable build and only loaded the same scenario to take the second screenshot. EDIT: Btw., do you see what happens to some of the arid vegetation on the floor in front of the player? Some of the shrubs just disappear and the grass becomes a little juicier. Lights at night don't seem to cast shadows correctly, always seems to be stuck in the one direction. Keep working guys ! You make a great work for this game ! I've been thinking the same for a while. Some of the shadows seem sharp enough to cut grass, oddly structures' shadows look more diffuse than object and vehicle shadows. 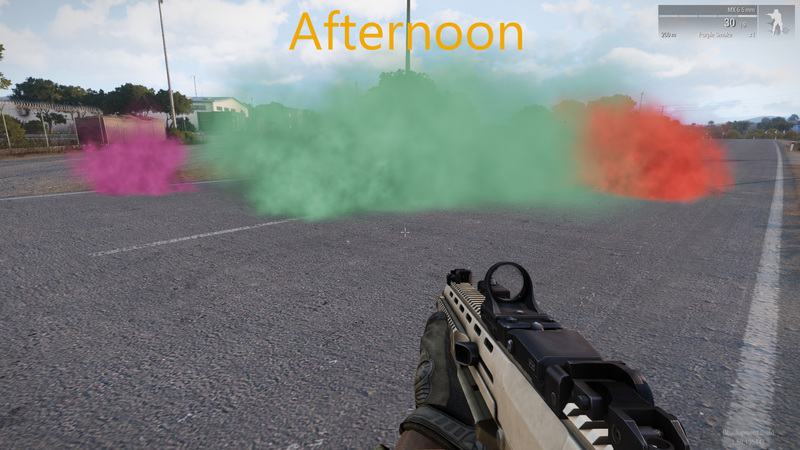 Since HBAO+ was introduced in Arma3, I had hoped we would get some more optional goodies like PCSS or TXAA.